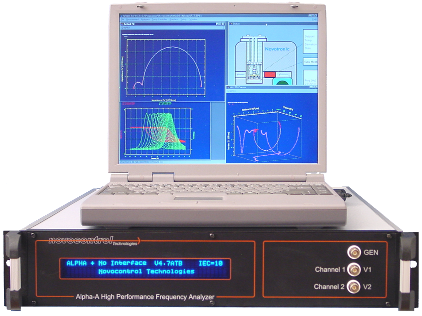 The Alpha-A mainframe is the master unit of the Alpha-A modular measurement system for electric frequency domain measurements. For dielectric, conductivity and impedance spectroscopy the mainframe has to be operated in combination with one or more test interfaces. The mainframe contains a frequency response analyzer with a sine wave and dc-bias generator and two ac voltage input channels. In addition, the mainframe contains the power supplies, analog and digital control lines and the firmware for operation of the test interfaces. After power on, the mainframe automatically detects the connected test interface and adjust the system functionality to it. 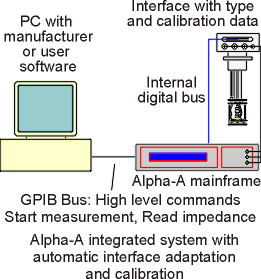 All system functions of the mainframe and a connected test interfaces are controlled by the mainframe IEEE488 GPIB interface port by high level GPIB commands via an external host computer as shown below. Without a test interface, the mainframe can perform two channel frequency response or gain phase measurements. The following mainframe types with different frequency ranges are available. If operated in combination with a test interface, the available frequency range may be reduced by the test interface frequency range. 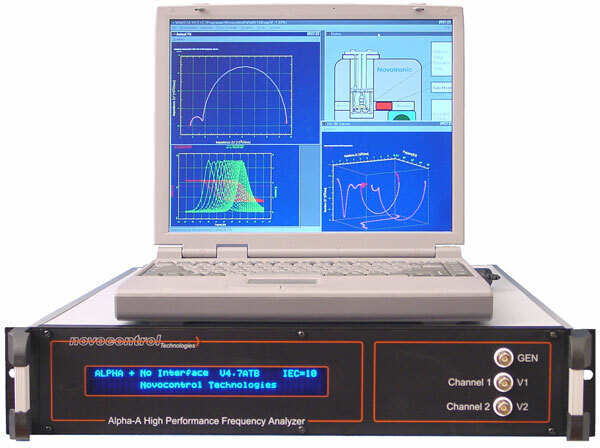 Impedance measurements up to 40 MHz (using the Alpha-AT) are currently supported by the Alpha active sample cell ZGS and the general purpose test interfaces ZG2 and ZG4. The recommended mainframe type with best performance/price ratio is the Alpha-ANB (20 MHz with dc bias). Without the dc bias option B, the dc bias functions of all test interfaces except POT/GAL 15V10A and POT/GAL 30V2A will be unavailable, too.